Old-school fans know that Howard Phillips used to be Nintendo's Games Master, immortalized in the back-page "Howard & Nester" comic strip of the recently cancelled Nintendo Power magazine. Phillips is a guy who helped the company on its rise to power in the United States. He probably has all kinds of cool stuff locked away somewhere, right? Yup, and now you can own some of it. Including an unprinted Nintendo Power comic with a cussword in it. Phillips told Luke Plunkett about the comic—made for him as a farewell present when he left Nintendo in 1991—back in September. Mind you, the lucky eBay bidder won't be getting the original artwork but will getting a limited edition one-on-one print. Phillips is throwing a ton of other hard-to-find Nintendo Power collectibles in the mix, too. So, if you've got a chunk of Christmas cash burning a hole in your pocket, you might be able to make yourself the envy of every other Nintendo nerd out there. 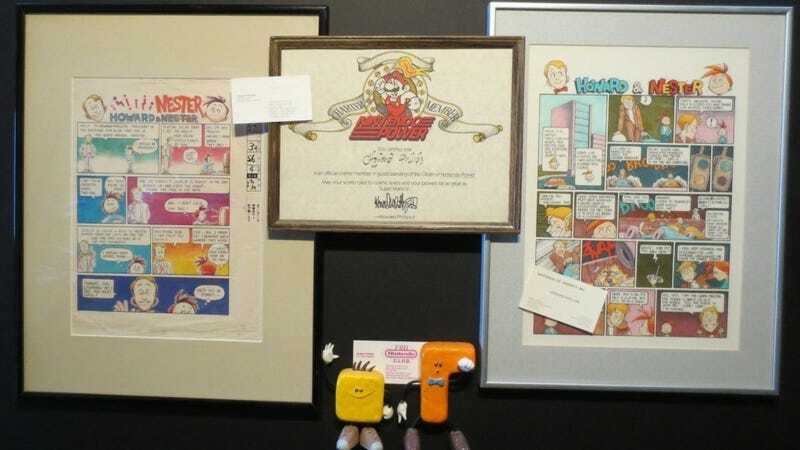 The Unpublished Nintendo Comic That Said "S**t"